There are so many options for shipping when you go to check out of Young Living with your order! At times I get truly confused by all of the options and the costs. So I decided to help you out some to see what seems to work best. Now even though I have the actual cost I paid for each on these packages, the cost for shipping will vary because of the weight of your order! So lets start with this months Essential Rewards order I placed: I decided I was going to go with the moderate priced item for my E.R. order. I choose the “Ground (3-5 days)” for $7.99 this month. The order was placed on the 18th. It also shipped on the 18th. It arrived on my doorstep on the 24th. So overall there was 6 days from the time I placed the order to the time it arrived on my doorstep. Not that bad of a turn around considering FedEx doesn’t deliver on weekends. So the second thing I did this month was redeem some of the Essential Reward points that I had earned. I decided to go with the lowest cost shipping that was offered. I choose the “Mail (3-8 days)” for $6.99 this time. I ordered it on the 18th. It shipped on the 19th. It arrived on my doorstep on the 26th. 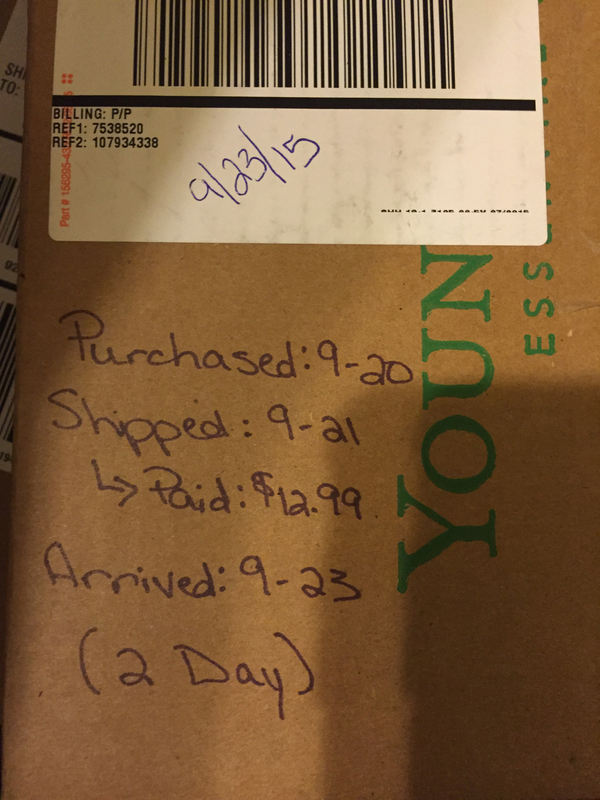 So overall there was 8 days from the time I placed the order to the time it arrived on my doorstep. Not that bad of a turn around considering it went through the USPS. In all honesty though I would rather pay the $1 more to get it two days earlier! The last thing I did this month was redeemed some more of the Essential Reward points that I had earned. This time though we really were in need of the oils that I was ordering. 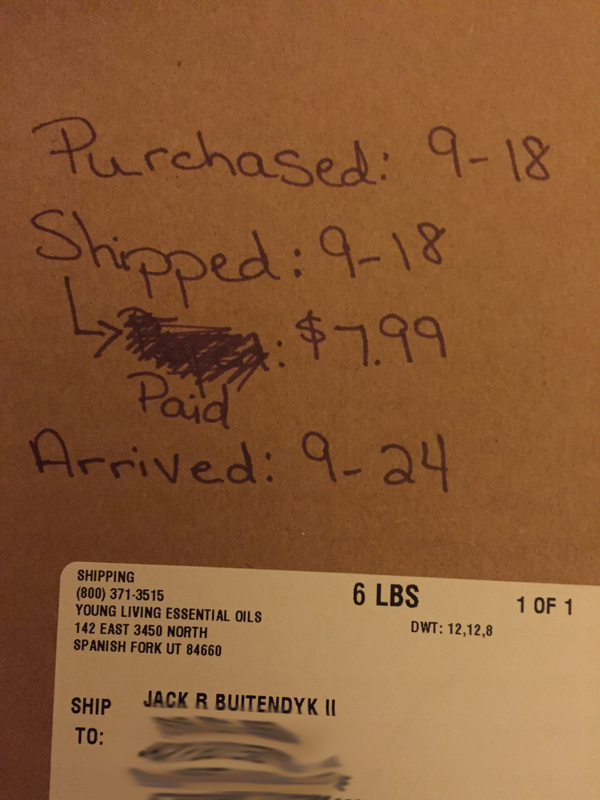 So I went the route of doing “2-Day Shipping” for $12.99. The order was placed on the 20th. The order shipped on the 21st. The order arrived at my doorstep on the 23rd. So overall there was 4 days from the time I placed the order to the time it arrived. 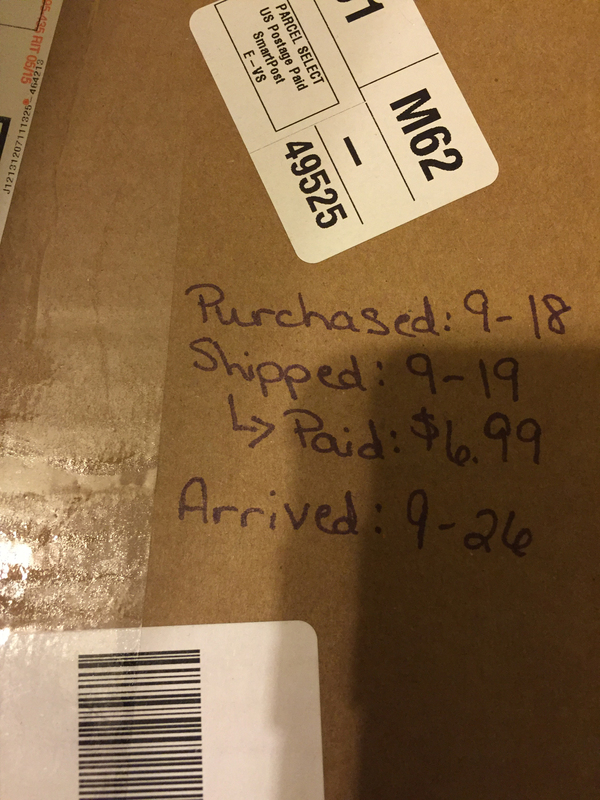 While it might seem a bit on the steep side to pay for shipping 2-Day; I placed the order late at night so it was really like I ordered it on the 21st. I had never used anything other than the Ground shipping by FedEx before. It was kind of nice to get a better idea as to what the different options do for the cost. Plus I learned that they really do honor that 2-Day Shipping. If I ever got to the point where I was out of an oil and it was a must have, I would not hesitate to do the Overnight Shipping or any of the faster shipping options!